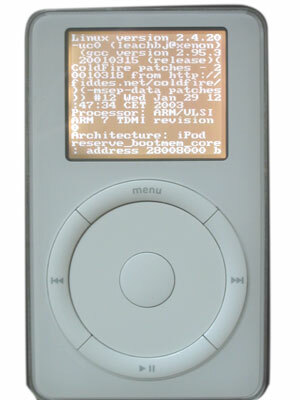 Linux Now Works on the iPod! It only works on Windows iPods right now, but maybe soon it will work with Mac ones. This proves that Linux fans will do anything to get Linux to run on any thing with a microprocessor. So you can play Doom. Oh boy. This looks really useful, just like the rest of Linux. For the curious, X11 apps wont run as the cut down version of Linux used lacks mmap(). For those wordering about the utility, it already plays ogg vorbis files and has the potential to allow two iPods connected by firewire to swap songs. The same reason someone ported Linux to the iPod: because you could, and you were probably bored.